Heat the oil in large pot over medium heat. Add the shallots and cook briefly to soften, 3 to 4 minutes, but do not brown. Stir in the broccoli, and season with salt and pepper. Add the chicken broth, water, and bullion cube, and bring to a boil. Reduce the heat to maintain a simmer, then cover the pan and cook until the vegetables are fork tender, 15 to 20 minutes. Cool for about 5 minutes. 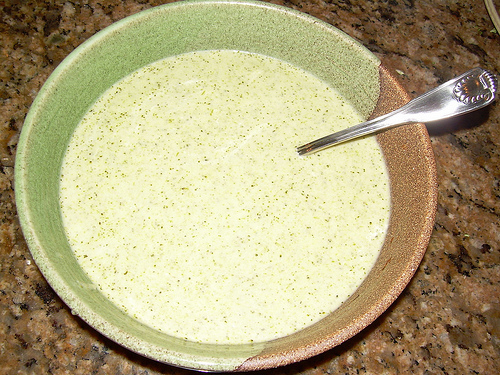 Carefully add the soup to a blender, in small batches, and blend until smooth (or use an immersion blender). Pour the puree into a clean large saucepan over low heat. Add hot water to thin, if necessary. Whisk in the mascarpone. Taste and adjust the seasoning, as necessary. OOO!! This looks wonderful. Love brocalli.